Ready to wear grad gear for each recruit battalion! Only at the EGA Shop. You can wear this shirt DURING 13 weeks of boot camp...don't pack it away, start wearing it TODAY! Maroon is for November, Oscar and Papa company. Show your spirit and wear your recruit's color! The 4th Battalion shirts are printed on a maroon t-shirt to show your battalion pride during the moto run on family day. You'll love these shirts enough to wear them before and after graduation! Our most affordable graduation t-shirt option is ready to ship to you today. We silkscreened our best-selling design on the front of a quality, Gildan brand, 6.1 oz., 100% preshrunk cotton T-shirt. Short sleeve is double-needle stitched and taped shoulder-to-shoulder. 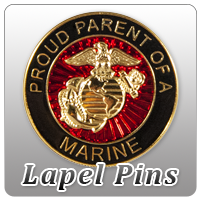 Design is United States Marines in a gradient with the Eagle, Globe and Anchor in the center, surrounded by a laurel wreath. At the bottom is the battalion number and Marine Corps Recruit Depot. Printed on the battalion color. Available in adult unisex sizes S-XL; 2X and 3X slightly higher. Youth sizes XS-L. These are pre-shrunk, but as with all 100% cotton shirts, they could be subject to additional shrinkage. If you don't want it snug after a few washings, order the next size up. We recommend measuring your favorite-fitting 100% cotton T-shirt and compare it to the size chart in the photos above. If your size is not in the drop down menu then it is out of stock and will not be available again at this sale price.